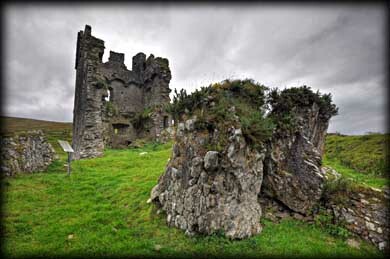 Built on the remains of an ancient ring fort and souterrain, this 15th century plain rectangular tower house was once a stronghold of the Knights of Kerry who belonged to the Geraldine (FitzGerald) family. 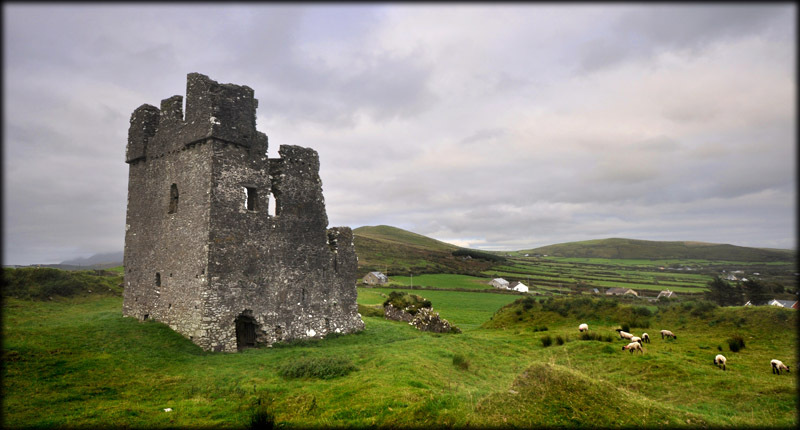 The powerful FitzGeralds also built the tower houses at Minard and Gallarus, as well as castles at Glandine and in Dingle Town which no longer exist. 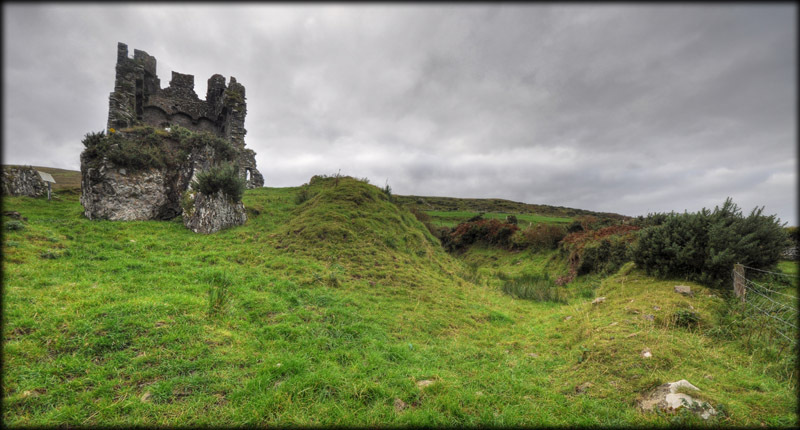 The amazing double banks and ditch of the 300-1000AD earthwork form a protective wall for this fortified house with commanding views of Ventry Harbour. The two earthen banks separated by a 30 foot deep fosse once enclosed a busy farmstead with houses, sheds, workshops and animal pens. Inside the fort is a souterrain - an underground stone-lined passage that was a refuge in times of attack as well as a place to store food. The ring fort is currently the holding area for lambs of the adjoining farm - the owners are quite accommodating and for a euro per person we were directed to park in their drive and shown the gate and pathway up to the castle from behind the house. Three walls of the 2-storey tower house remain - the missing east wall provides a peak into the interior with traces of vaulting above the ground floor, mural stairs between the ground and 1st floors, a blind arcade, crenulated parapets, and a projecting corner turret. The second floor appears to have been the great hall with large windows and a distinctive decorative arcading - probably a beautiful room in it's heyday. 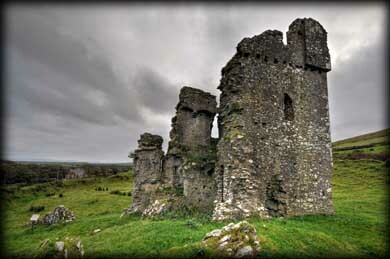 This castle, like so many others across Ireland, was attacked and destroyed by Cromwell's forces around 1650. 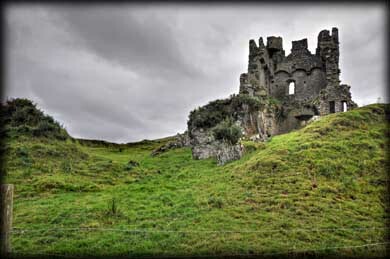 The image above shows the castle, the inner bank, the fosse and the outer bank. Situated: From Ventry, west of Dingle. Take the R559 for 450 metres, then turn right for Ballybeg. After 1.3 kilometres turn left toward the Farmhouse. Ask here for permission to visit the castle. Discovery Map 70: Q 3687 0170. Last visit Sept 2012.